AAA State of Play Blog: How Can Play Therapy Help Children Heal and Thrive? How Can Play Therapy Help Children Heal and Thrive? When you think of therapy, do you think of toys, costumes, drawing materials, sand, water, balls, or clay? These fun tools are exactly what play therapists use to help kids grow, thrive, and heal. I've seen it work for many kids, and it makes sense since kids use play to explore the world, learn about life, regulate emotions, and develop their sense of self-worth. Play therapy can help your kids and kids of all ages in several key ways. Instead of using words to tell me how they felt, my young girls stomped their feet when they were angry or squealed in delight when they were excited. It takes maturity and training for kids to verbalize their feelings. That's why play is essential. While playing in a safe environment, children can act out, draw, or verbalize how they feel and discover how to express their emotions every day. Stress is a serious adult problem, but it affects kids, too. They can feel worried, anxious, and stressed about family dynamics, health issues, friendships, and other challenges. Childhood stress can affect their physical health, school performance, and relationships. During play therapy, kids find stress relief. Not only do they identify and process the causes of their stress, but they also learn how to use play and fun to relieve stress in a natural way. If your child experiences one of these traumas, give them access to play therapy. It can assist them in working through the traumatic experience and finding the healing they need and deserve. A few months ago, my daughter experienced several anger outbursts. I was baffled about it until I took her to play therapy. There, she was able to work through her feelings about her best friend moving away. If your child's behavior has changed, consider play therapy. It's a non-threatening outlet that helps kids find healing and make positive behavioral changes. We like to shelter our kids from real-life hurts, but as a mom, I know that's impossible. Instead, we can equip them with coping skills that help them grow and mature. I appreciate how play therapy equips kids to see situations in a new way and discover and rehearse the right way to approach and handle those situations. They can role-play a social circumstance or practice a hobby like cooking or art that allows them to release pent-up emotions and handle life in a positive way. Play therapy also helps kids take responsibility for their actions, solve problems, and become more self-assured about their ability to find solutions to everyday challenges they face in real life. I watched my girls play with the neighborhood kids this weekend and noted how one kid used intimidation to get his way while another teased her brother until he almost cried. I did intervene in both cases but also realized that these kids need to develop social skills and learn how to relate to others. Play therapy teaches kids how to respect and accept themselves and others. It also cultivates empathy and respect for the feelings, opinions, and thoughts other people have. Learning to relate to people is a skill kids must learn, and play therapy teaches these lessons. Many play therapists understand that parents play a key role in a child's life success. That's why they introduce filial play therapy, where the parents get involved. Parents who play with their kids enter their child's world. They discover the hopes, dreams, fears, and challenges their kids face, and they can begin communicating more. Closing that communication gap allows parents and kids to build stronger relationships that weather emotional storms and help kids thrive. Thankfully, my girls' school still offers recess breaks every day, but many school take this play time away. Computers and TV screens take over at home, too, as kids spend more than seven hours in front of screens each day. That means kids are not getting enough time to release energy, reduce stress, and have fun. Play therapy can fill the recess void and give kids an excuse to play. 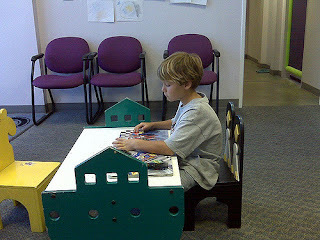 The therapist can even give kids play homework that keeps them active between sessions. Now that you know how play therapy can help your kids, you may be ready to use it with your children. Ask your family physician or your child's mental health professional for a referral. Play therapy sessions usually occur once a week for 30 to 50 minutes. Ideally, your child will choose the therapy activities so that they feel safe. I've seen how it works firsthand to help kids grow, thrive, and heal. How could it help the children you love?